Recently, there has been uncertainty surrounding the need for Business Cards in today’s business world. Most business now takes place digitally; from signing a contract, to taking meetings on Skype. However, at Kaizenprint we believe the Business Card still has relevance! We’ve all been there. You start speaking to somebody and say you will email them or contact them later. But as soon as they leave, you’ve forgotten their name. The Business Card acts as a memorabilia of conversation and a path to opportunity. If you are handed a business card, you can write a few bullet points to remind you of the conversation and follow up later on, enabling you to build that important report. When you hand out a Business Card you look professional. It shows that you are prepared, experienced and, well it just looks better than searching every nook and cranny for that pen and paper you ‘know’ you must have somewhere. So, with that being said here are 3 ways in which you can improve the format of your Business Card. When creating a business card it can be tempting to want to cram as much information in as possible, but there’s really no need. The chances are, somebody who has your business card has already met you. The business card will just act as a reminder. On one side you could have your contact details, whilst on the other, you could showcase the company logo and website information. Social media can be a great way to network with prospective clients, but only if used correctly. Shy away from including personal Facebook, Twitter and Instagram accounts. Generally, contacts made in a business capacity won’t want to see your afternoon brunch or workout session. Keep it to Linkedin or a company Twitter account that showcases your business knowledge. Who are you, and what do you want your business card to say about you? When deciding on your perfect business card you should consider the above questions. Your business card gives an impression of you and your brand, so it should easily communicate this. Make it memorable. Otherwise, you could find yourself lost in a drawer of cards, and when they need a certain service – the card that stands out, or is most memorable, wins! Be creative and express yourself. If you are a musician, you could incorporate piano keys into your card. If you are a graphic designer, why not demonstrate your design personality, be that bold or minimalist. Gone are the days of the rectangle business card as a satisfactory design. 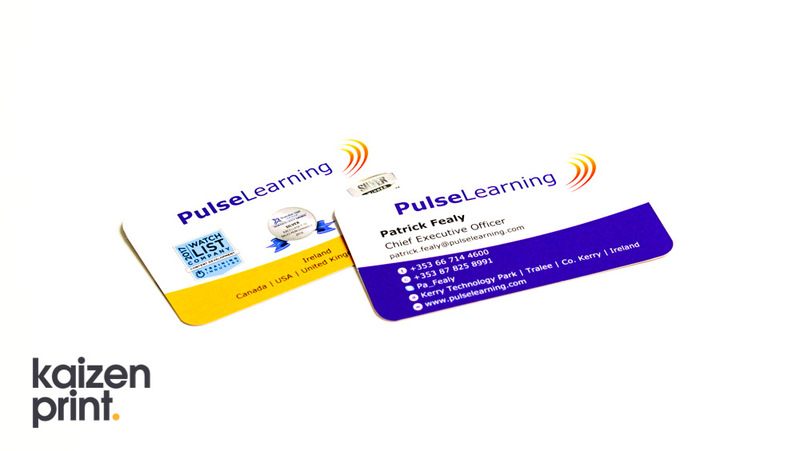 As a simple adjustment, you could curve the edges or have a square business card. At Kaizenprint we offer a range of Business Card designs including luxury (400 gsm), rounded corners and brown kraft paper – these would be great for businesses with a vintage feel. You could add special effects, including gold foil, spot raised, and light reflecting. A great example of how a Business Card can show who you are is from the company MOO, who’s Business Cards are made from recycled T-shirt fabric! We think this would be amazing if you have an ethically centred business or work in the fashion industry. Even more specialist, business cards can be embedded with an NFC chip – bringing digital technology into your business card. By tapping the card with an Android or iPhone you can trigger a digital action. For example, opening your website or social media page. What action do you want the recipient to make? Think about how you can add value. Adding value to your Business Card can reinforce who you are. As well as trying not to overcomplicate your Business Card with clutter, it is important to show why somebody should get in contact with you again. You could offer a discount on services or direct the recipient to your website. By adding the ideal call to action you can direct the recipient somewhere memorable, this, in turn, will generate more sales. The key is: don’t include every possible element to your business card. Use it to express your branding and personality and remember the importance of the Business Card as a business tool! We believe that Design is just as important as Print. Get in touch with us here at Kaizenprint if you have any queries regarding either matter. Our talented in-house design team have experience with Corporate Branding including Business Card creation, as well as Logo Design and Brand Creation – all of which can add to creating the perfect Business Card for you. Any questions? Contact the Design team now on 028 9002 2474. This entry was posted in Printing and tagged business card printing, business card uses, Business Cards, improve your business card.